If 2016 heralded the political post-truth world, athletics has been a post-border domain for several years now, and all very much with the blessing of the IAAF. 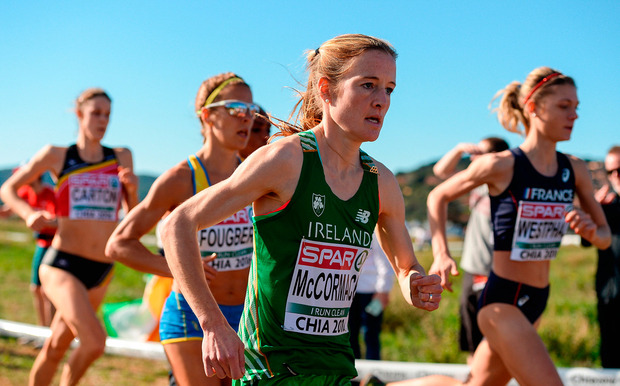 At the European Cross-Country Championships on Sunday, Fionnuala McCormack missed out on a medal because of Kenyan athletes competing for Turkey. After the race, McCormack was resigned. "I think you can write the script at this stage. I'm a bit reluctant to say anything more about the Turkish situation," she said. Back in July we saw her true feelings. Speaking after the 10,000m European final, McCormack raged: "It's a joke. People shouldn't be allowed to hop countries just because they feel like it. They're (IAAF) taking such a soft approach. I don't just want to go on like I'm bitter for coming fourth, because I'm not, but there's a reason it's called the European Championships"
Yasemin Can and Meryem Akda of Turkey finished first and second on Sunday. Both athletes transferred allegiance from Kenya in 2015. Neither have any Turkish heritage, residency or affinity with the country. As Ian O'Riordan pointed out on Monday's Off the Ball, the European Championships were originally set up in 1994 to incentivise distance runners around Europe and raise standards which were falling terribly. European runners aren't feeling very incentivised right now. McCormack is 32 years old and will spend the remainder of her European career chasing behind 19-year-old Can. Why is this happening? In matters of allegiance, there is currently a 12-month waiting period for competition once an athlete receives a passport. However, the IAAF says that in "truly exceptional circumstances" the waiting period can be eliminated. It is unclear what these circumstances are. In the six months before Rio 2016, there were 86 international allegiance transfers; the majority which were to Turkey, Qatar and Bahrain. Back in July, there were seven Kenyans, two Jamaicans and a Cuban competing for Turkey at the European Championships. The last three men's European Cross-Country titles have gone to African-born athletes. McCormack, and indeed most reasonable people, know where the issue lies. She said: "I think it's from the top that a change needs to be made. A lot of the problems in our sport come from the top down." Seb Coe took to Twitter after Sunday's race. "Working on this and will sit with new Athletics Integrity Unit that the IAAF Congress approved - launching April 17". But in some respects, the damage has been done. For the next decade we will see non-European athletes, who have already secured their swap, dominating many of the events.